Wow! This week absolutely flew by. I am so happy, though, because I have lots of fun things planned for this weekend. Ryan has to work during the daytime, but I'm sure EK and I will meet up with him for some of our activities. That's all! I love writing out my plans. It seems like I really have a focus and get so much accomplished. I've given up on finding the perfect fall wreath. (Although, a patient did have a gorgeous one this morning on her door. Too bad she has dementia and no idea where it came from!) I can't wait to update with photos from our weekend. 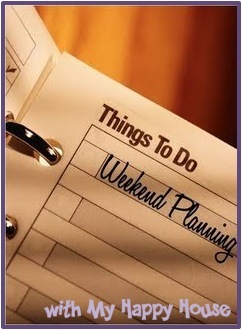 What things do you have on the books for the weekend? I just started working on swapping out some of Cam's clothes yesterday. Oh it makes me so sad :( Thanks for linking up K!